Afternoon lovelies! 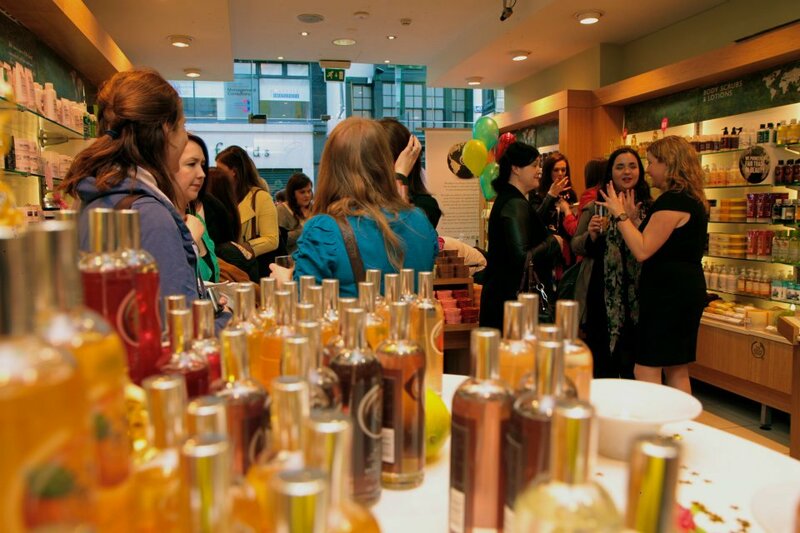 The other day I went along to a fabulous event in The Body Shop, on Grafton Street. The Body Shop were launching their new 'Beauty With Heart' campaign, as well as introducing their fabulous new advocate Lily Cole's makeup range. It was my first Body Shop event to attend, and I was thoroughly impressed; the staff we're so friendly and informative, and the shop was filled to the brim with yummy goodies and beauty products for us to get our paws into! 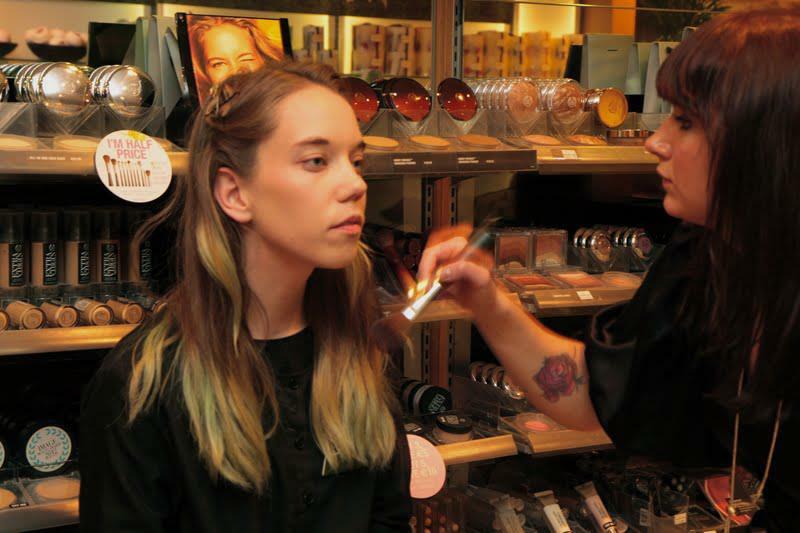 The Body Shop launched their Beauty With Heart campaign, to put emphasis on the fact that beauty should be skin-deep - they want their customers to not only look good, but to feel good and do good. Not only will the customers look good from the outside by using Body Shop products, they'll also do good by purchasing a Community Fair Trade product where the proceeds go towards campaigns to benefit human welfare globally. The Body Shop has always taken stand against animal testing and guarantees each product is cruelty-free and vegetarian. The introduction of Lily Cole as the brand's new advocate adds a new, youthful edge to The Body Shop's makeup lines. I'm totally in love with the collection, and I know you guys will just love it too! I was lucky enough to receive the new Pearl Radiance primer and Shimmer cubes in my goodie bag, as well as a delicious Satsuma body mist and Moringa beautifying oil - I'm definitely going to review/ feature my lovely new treats, so keep an eye out. The new Lily Cole limited edition makeup range, includes a ton of fabulous new treats for all Body Shop lovers! The range includes two Hi Shine lipglosses, a Pearl Radiance primer (my fave), a mini synthetic brush set, a purple liquid liner, a Puff On Radiance powder, Shimmer Cubes and the oh-so amazing two Lip & Cheek domes. All of the Lily Cole makeup line is 100% vegetarian, no bug shells/ shellfish/ animal hair were used in the manufacturing on the products. I personally adore the packaging, and the dome-shaped products are so retro and quirky. I've always loved Lily Cole, and think she is such a fantastic choice for The Body Shop to introduce their fabulous new campaign. I wore quite a fun outfit that day, including a ton of Summery prints! Unfortunately I was having a bad hair day (my hair can never curly, it only kinks), and looking back I quite a bad makeup day. However, these things happen and I think my leggings distracted everyone away from my upper disasters! I wore my Topshop leather jacket, a vintage shirt from Fanci Shmancy, a Topshop cross necklace, my Versace for H&M leggings, an ASOS satchel and white high-top Converse (all of my new Asos pieces will be featured in a haul video next week). I loved the outfit, and adored how comfortable, casual yet edgy it was. Topshop jewellery | Maxfactor's 'Diva Coral' and Elf's 'Golden Goddess' nail polishes. All photography by Conor Clinch // The Body Shop Ireland.